Mon., Sept. 25, 2017, 7:50 p.m.
MINNEAPOLIS – The last thing Minnesota Lynx coach Cheryl Reeve wanted to talk about was a moral victory. She had no time for pats on the back after her team came back from 26 points down in Game 1 of the WNBA Finals. In the end, the Lynx are down 1-0 to the defending champion Los Angeles Sparks in the best-of-five series because they fell behind 28-2 in the first quarter on their home floor. It was likely a calculated move on Reeve’s part, a salvo that will turn up the heat on a veteran-laden team that did not grab a single rebound in the first quarter of the opener. A wake-up call for a team nobody expected to need one. 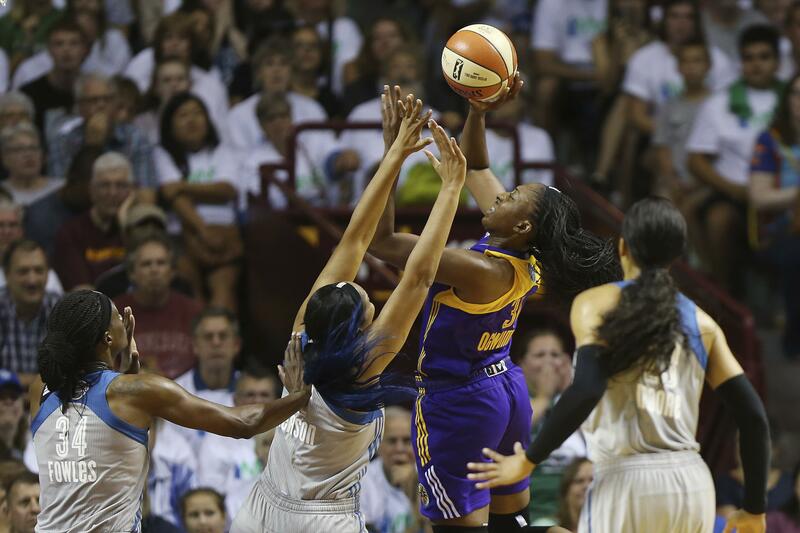 After sitting out the national anthem, the Sparks roared out of the gates in the first eight minutes, leading 12-0 and 28-2 before Minnesota even knew the game had started. The Lynx turned things around when Maya Moore moved from small forward to power forward and guard Jia Perkins took the place of mainstay Rebekkah Brunson. The small lineup created havoc on defense and helped Minnesota wipe out a 12-point deficit with five minutes to play it the game. Moore’s layup with 6.5 seconds to go put the Lynx in front, 84-83, but Chelsea Gray hit a 14-foot jumper in the closing seconds to win the game. Reeve let loose to the media without her players’ knowledge, but there was little disagreement about the embarrassment surrounding the first quarter. The highly anticipated rematch between the two best teams in the league delivered the best overnight rating (0.6) for a WNBA Finals Game 1 on the ESPN networks, up 20 percent from last year’s Game 1. What appeared to be a laugher in the early going turned into a tense, back-and-forth finish. The Sparks are trying to become the first repeat champions in the league since 2002, and they are not expecting a similar start for Game 2 on Tuesday night. Seimone Augustus has felt Reeve’s wrath before and did not want to give too much weight to the emotional remarks. With the prospects of an 0-2 hole staring them right in the face, Reeve clearly felt those buttons needed to be pushed. Published: Sept. 25, 2017, 7:50 p.m.